Summer is the official season of berries. As you may remember, I made individual blackberry crumbles last week. I wanted to come up with a recipe for a crowd that would be light enough to serve after a big meal. I love this shortbread crust and the natural flavors of the berries that show through. 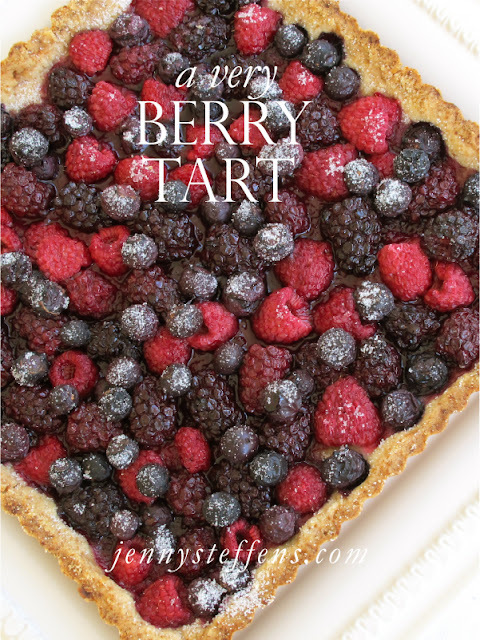 If you'd like to serve the berries fresh (instead of cooked with the crust), just bake the crust first and pile on the berries when the crust has cooled. It is great with ice cream or whipped cream. For the crust, combine flour and brown sugar in the mixing bowl. Cut cold butter into small pieces. Add it to the flour mixture. With the whisk attachment mix the butter into the flour and sugar. The whisk will help to "cut" the butter into the dry ingredients. When it is crumbly, add egg yolk. Mix together. Press the mixture into a tart shell. The mixture will be crumbly and loose. Option 1 : Bake for 15-20 minutes at 400 degrees until brown. Cool and pile with fresh berries (no sugar needed). Serve with Ice Cream or Whipped Cream. Option 2 : Pile berries into the uncooked crust. Sprinkle sugar over the berries. Cook for 400 degrees for 20-25 minutes until the edges and the berries begin to bubble slightly. Serve warm with Ice Cream or Whipped Cream. The crumbly mixture. The whisk will help to cut the butter into the flour and sugar. With your fingers, press the crumbs into the tart pan. You can also use a pie plate. Add the berries on top of the crust. I used blueberries, blackberries and raspberries, but you could use strawberries, peaches, plums... whatever you have. Out of the oven - doesn't it look good?! I love that there is not anything on the berries (but a little sugar) to hide their flavors. The crust is like a crumbly, sandy shortbread cookie. This looks delicious! Perfect for this time of year when berries are at their best! Hi! My name is Laura and I found your blog through Pinterest. I just read through all of your posts and am officially a fan! I'm going to make this recipe this weekend - it looks divine! What pans do you use? I would love a post on your favorite cookware and kitchen tools. Jenny this looks like the perfect 4th of July dessert!! I have some round tart pans I haven't used in a long time. What a fun way to use all those gorgeous berries I saw at the country market last Saturday. Drooling already! Thanks!!! This dessert is perfect for the coming 4th of July. I love its simplicity, highlighting the freshness of the berries. Beautiful! This looks absolutely delicious Jenny, I must make it this summer when these fruits are back in season, its winter here in NZ :(. I have made this pie a thousand times in the past and was searching EVERYWHERE for it. It is simply everyone's summer favourite. (especially the cook) Thanks for posting.